Lifting the lid on the often unspoken taboo subject of menopause. 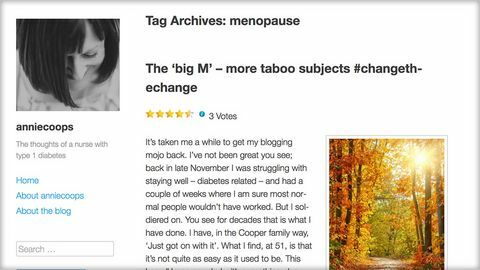 Annie Cooper is a qualified nurse who blogs about her own T1 diabetes. Good down to earth advice and sharing of experiences. Annie Coops always write well. Good blog recognising that for women reaching a certain age, the menopause will not only have the usual physical impact on you but will also have an impact on your diabetes. From my own experience, I agree that it is a subject that is rarely discussed, unlike the hormonal impact of adolescence and pregnancy on control. Although this does not offer any solutions, it is good to see the subject raised.